Jerusalem artichokes are a great reliable food source. 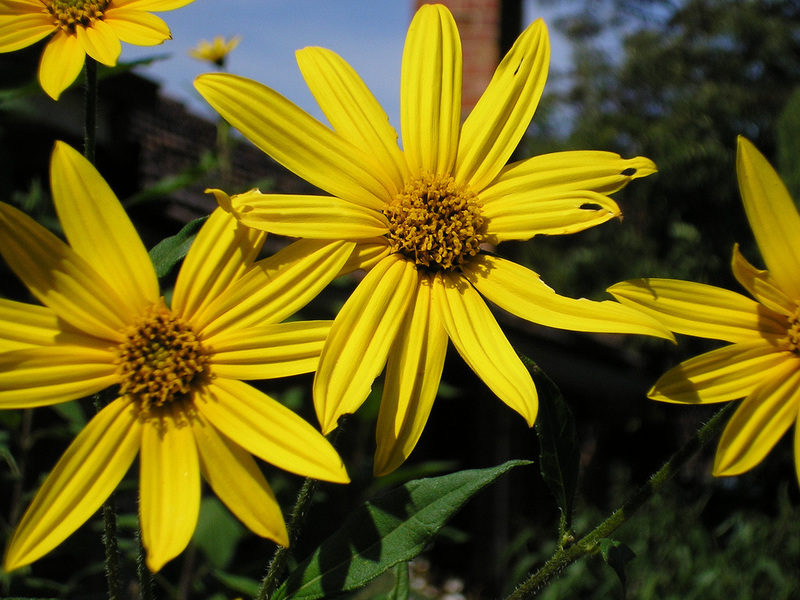 Once established, Jerusalem artichokes are practically imperishable. They grow in poor soil, tall enough to shade out competing weeds; their only need may be perhaps a little water in a very dry spell. They need no winter protection and have been know to grow in compost piles from nothing more than kitchen peelings. It has been said that the only way to get rid of an established bed of Jerusalem artichokes is to move away. One word of caution, however, some people have problems digesting Jerusalem artichokes. Over 50% of their carbohydrate is in a form that is difficult for humans to break down (beans contain only 10 to 15% of the same substances). For those who have trouble with the extra fiber, there are a few things you can do to make them more easy to absorb: refrigerate the tubers for at least a month, then slice and boil in plenty of water for 15 minutes adding one tablespoon of lemon juice to each five cups of water. After they have been boiled, drain, slip off the peel and pat dry. The slices can then be marinated, dehydrated, barbecued, roasted, deep-fried, made into soup, or pureed and used in pies, cakes, or scones. Pureed artichokes can used in place of pumpkin in any recipe, just reduce the amount of sugar slightly. They could also be cooked whole in a crockpot on low for 24 hours prior to using in the recipe of your choice. ​ Jerusalem artichokes are surprisingly sweet with a slightly nutty taste or perhaps a hint of mushrooms. If you are able to eat them raw, they are similar to jicama or water chestnuts — serve them with a dip or add them to a fruit or vegetable salads. They can be scalloped, baked, or sautéed with butter and herbs. Try adding them to a roast with carrots and potatoes. Combine all ingredients reserving ½ cup of grated cheese. Pour into a 2 quart casserole dish and sprinkle with remaining cheese. Bake at 350° for 45 to 50 minutes or until tender. Scrub or peel artichokes. Slice each artichoke to ¼ inch thick slices. In a frying pan, heat olive oil and butter on medium-high heat. Add sliced artichokes, garlic, salt, pepper and parsley; stir well to coat artichokes. Stir-fry for about 4 minutes, stirring often. Do not overcook artichokes, they should be slightly crunchy. Serve immediately. Peel (or scrub) and slice the Jerusalem artichokes. Place them in an oiled frying pan and fry on a medium heat until golden on both sides. Add remaining ingredients, reduce heat to medium low and cook, covered for about 25 minutes. Remove bay leaves before serving. Toss the Jerusalem artichokes in olive oil in a roasting pan. Pieces should not be touching. Sprinkle with the minced garlic and roast in a preheated 475º oven until tender, about 15 minutes, stirring twice during the cooking process. Then broil, watching carefully, for a few minute to brown the edges. Add butter and parsley and toss to coat. Season with salt and pepper and serve immediately. Melt 1 tablespoon butter with olive oil in large nonstick skillet over medium-high heat. Add Jerusalem artichokes and half of the sage. Sprinkle with salt and pepper. Sauté until brown and just beginning to soften, turning frequently, about 10 minutes. Using slotted spoon, transfer Jerusalem artichokes to shallow serving bowl. Add remaining 2 tablespoons butter and sage to skillet; fry until sage darkens and begins to crisp, about 30 seconds. Add lemon juice; simmer 1 minute. Pour lemon-sage butter over Jerusalem artichokes in bowl, tossing to coat. Season with salt and pepper. Sprinkle with parsley. Whisk orange juice, vinegar, and mustard to blend. Gradually whisk in oil. Season with salt and pepper to taste . Combine Jerusalem artichokes, arugula, and Parmesan and toss to coat with vinaigrette. Fill a large bowl with cold water. Slice sunchokes into thin rounds (about 1/16 inch thick), and immediately drop them into the water to prevent browning. Rinse and drain 3 times. Pat very dry with paper towels. Pour enough oil into large deep skillet to reach depth of ½ inch and heat to 375°F. Mix one tablespoon salt and rosemary in small bowl and blend well, rubbing salt and rosemary together. Working in batches, fry sunchoke slices until golden brown, stirring occasionally, 3 to 4 minutes. Using skimmer, transfer chips to paper towels to drain. Sprinkle with rosemary salt. Chips can be made 2 hours ahead.